You say tomato, I say Bloody Mary. For those of you familiar with Milwaukee, I can simply say that Bourbon & Tunns is the old Palms Bistro on 221 N Broadway. I’m not sure about all the details, but the Internets tell me they are by the same owners. Perhaps it was just time for a facelift. I was a personal fan of Palms Bistro and I can’t say I really understand Bourbon & Tunns. It’s quite new though opening in March (open delayed due to a massive fire). The inside of B&T seems generic and almost had me wondering what they were going for. Their website has a lenghty description of who Bourbon & Tunns were – learning is good, friends. Being a super nerd, I know it’s far too long of a decription to have on a website. Anyway, I digress. We stopped in to give it a try and I was pleased to hear they make their own Bloody Mary mix. Mix: My first sips of this had me so curious. The mix was heavily granulated with pepper and what I assumed to be horseradish. It had a certain taste that I just couldn’t put my finger on. TJ thought pickle juice but I just had to ask the bartender. After some coxing she said she’d ask the manager what was in it – she said he liked to keep it a secret. The only secret she let me in on was “I think he puts liquid smoke in it”. Um, what? Regardless of whats inside, it was the perfect amount of spice for me and didn’t leave me disappointed at all. Garnish: I was a bit underwhelmed by the accessories. It was very standard with a big pickle spear, olive, lemon and lime. The menu at B&T is pretty large and I’d find it hard to believe they can’t dress this Bloody Mary up more. However, I will say, I don’t think this Bloody needs to hide behind any masks. Chaser: We were not offered chasers. Buzz: Even on a hungry stomach, I did not catch a buzz from this Bloody. Cost: This bloody wasn’t on the menu and the bill was not itemized so I’m really not sure how much it was. If I had to price it myself, I’d say between $6-7 would be fair. The bottom line: I’d highly recommend stopping in this place to give it a try. The service was great and they seemed to have a pretty large selection of dark liquors. This bloody went down so smoothly, I was actually disappointed with how quickly I drank it! What is with people infusing drinks with smoke lately? It seems like the smoke always overpowers everything else. I can understand the idea behind it, but I’ve never had a drink where it was done well. Save the Liquid Smoke for the beef jerky, please, bartenders of the world! 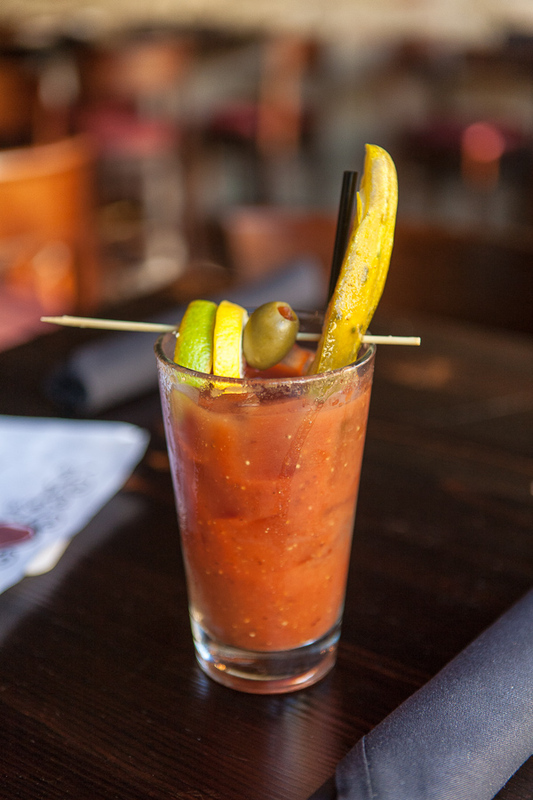 This entry was posted on April 29, 2013 by Shannon in Bloody Marys in the area and tagged bloody mary at bouron & tunns, Bourbon and Tunns, Broadway, good bloody mary in third ward, Milwaukee, Milwaukee Bloody Mary, old Palms Bistro, Third Ward.